Posted by Teresa Mihelic HelpDesk on Wednesday, November 28th, 2012 at 12:25pm. We Love Talega, and Ladera Ranch. And the same goes for Las Flores, or communities alike in Rancho Santa Margarita and Aliso Viejo. Yes, these are tract homes. Yes, there's HOA's and mello roos. Yes, most houses look alike. But during the holidays, these neighborhoods get some really special decor, more so than in any other neighborhoods in Orange County, and makes many families wish they lived there. Because these neighborhoods are full of families with kids, no matter where you live in these neighborhoods, in every street there's lights and color displays as neighbors decorate their homes in celebration of the Holidays. Talega for example has a holiday celebration this coming Saturday December 8th 2012, with holiday crafts, cookie decorating, breakfast snacks and Holiday drinks and a visit from Santa to take your Christmas wishes and a photo keepsake. Also there's neighborhoods contests for the llighst and christmas decorations: Most Humorous, Simply Elegant, Magical Effects, Bright Lights, Best Theme, Special Effects and Best Neighborhood Decor. 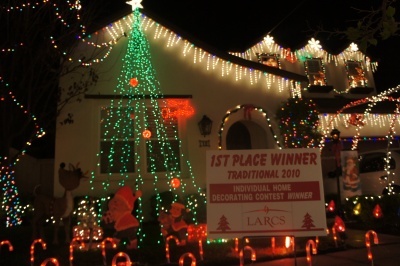 Ladera Ranch has some of the best displays of Christmas lights and home owners participate in the annual holiday decorating contest that not only include neighborhood 'theme's', most Creative Use of Lights, Best Yard Display and others, but also individual home contests. The two communities have shopping centers that also host "holiday extravaganzas" where children can take photos with Santa and reindeers and make crafts. There's holiday music, food and beverages and, in Ladera Ranch, there's the traditional Christmas Tree Lightning Ceremony, with cookies, hot chocolate and coffee as you take your family holiday pictures in front of the tree. These two award winning communities are perfect places to call home and what a great way to experience these neighborhoods during the Holidays! Ladera Ranch has the guard gated luxury homes in Covenant Hills, so access is restricted there, but the rest of the neighborhoods can be toured with no problem. Same goes for the Talega homes, where most neighborhoods are not gated - only Careyes, Lucia/Alta , Vittoria/Catania and the active senior community of the Gallery can't be accessed without a code. So come on, enjot these displays, and contact us if you are interested in knowing more about the real estate opportunities that both of them have!